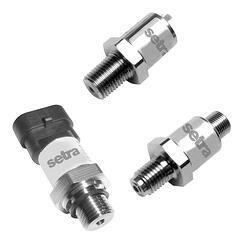 Best in Class Price to Performance - Strain Gauge technology provides a very linear and predictable output signals over wide temperature ranges, which enables Setra to provide an inherently stable and accurate sensor element in high volume and at low cost. The Model 31CS sensors constructed using a highly sophisticated automation process, where the sensors are manufactured in a Class 100 clean room. To ensure best in class accuracy and long term stability, each sensing element is thermally compensated to an accuracy of less than 0.005%/°C prior to leaving the clean room for final assembly. Thermally compensating the unit ensures improved accuracy and simplified conditioning electronics; while eliminating the need for calibration over elevated temperatures as a transducer. Unrivaled Quality - Setra understands the importance of quality in OEM applications, which is why we are always looking for ways to improve the quality rating of the product. Over the last two years, the Model 31CS failure rate is less than 0.1%, a quality rating unmatched by the competition. The worst thing that could happen to an engineer is to shut down their work because of quality issues, Setra takes this seriously which is why we have worked hard to ensure that product improvements are made to reduce quality issues to our customers. Rugged Designed - The Model 31CS compact welded stainless steel designs are constructed to protect the sensors in demanding industrial environments. The electrical connectors are tested to an environmental protection specification of IP67 and a robust internal design ensures that the transducers can survive high levels of vibration. A high level of EMC protection allows the transmitters to perform to the most stringent of industrial standards and all devices are RoHS compliant.